I just saw that link on Drudge, and spent time wondering how you even get in that position. How on earth do bees get in your eye? Helmetless beekeepers. The dangers are real. CNN BREAKING NEWS!!! 40 year old Woman born with bees for eyes. Trumps fault. This is nearly as bad as brain eating ear borers or nostril snakes (on a plane?). Yeah, just change that to "My mommy said not to put bees in my eyes!" The only way bees could get into a person's eye is if they were passed out COLD for long enough for four sweat bees to fight their way into her eye. But even if she is passed out and not noticing bees trying to crawl into her eyes- how in the hell would they get into her eyes? Does she have super loose skin around her eyeballs that gape open or something? I'm done pondering this one because my eyes now feel itchy. "A man who has been left bedridden due to his gigantic leg is pleading with doctors to amputate the limb. Muhammad Mushtaq has elephantiasis - caused by a parasitic infection that stops the lymphatic system from draining unwanted fluid and toxins from its tissues. This has caused the 40-year-old's left leg to swell to ten times its normal size over the past two years. It now weighs in at an enormous 330lbs (150kg). The former butcher, who was forced to give up work, now relies on his brother and sister-in-law to meet his 'basic needs'. Mr Mushtaq, of Gujranwala, Pakistan, claims a local doctor said surgery to treat his leg could be deadly. He is now appealing to his government to pay for him to see another medic, even if it means being told his only option is amputation. " I guess you can hardly feel them sometimes. Curious to know more, his team launched a year-long study. They stopped by 10 sites throughout Thailand. They studied dry and wet sites, at high and low elevations, in evergreen forests and floral gardens. At half of the sites, they put out seven smelly baits that they knew many bees like — such as steamed sardines, salted and sometimes smoked fish, smoked ham, cheese, fresh pork, old meat (not yet rotted) and the Ovaltine powder used to make cocoa. Then they watched for hours. 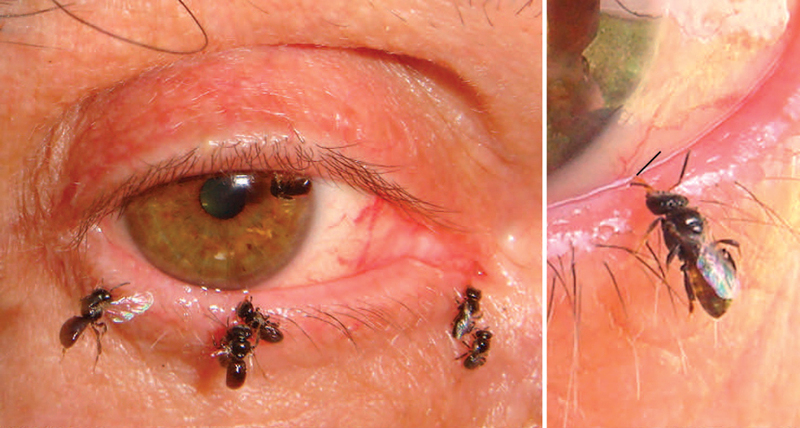 Many stingless bees visited the baits — but none of the type that had shown a preference for tear-sipping. team leader Bänziger volunteered to be the primary guinea pig, allowing more than 200 interested bees to sip from his eyes. His team recounted the bees’ behavior in a 2009 paper in the Journal of the Kansas Entomological Society. It didn’t hurt, Bänziger reported. In some cases a bee was so gentle he wasn’t sure if it had left until he used a mirror for confirmation. But when multiple bees came for a joint drink-fest, which might last an hour or more, things could turn itchy. Bees sometimes cycled in to take the place of a departing bug. Several insects might line up in a row, each slurping up tears for several minutes. Afterward, Bänziger’s eye sometimes stayed red and irritated for more than a day.